There are many things to gain from a beautifully designed kitchen with built-in appliances that blend in seamlessly with the rest of your cabinets. Not only is the kitchen the heart of the home, it can be a crucial factor when it comes to selling your property, so a bit of time and effort spent renovating it can reap considerable rewards in the long term. 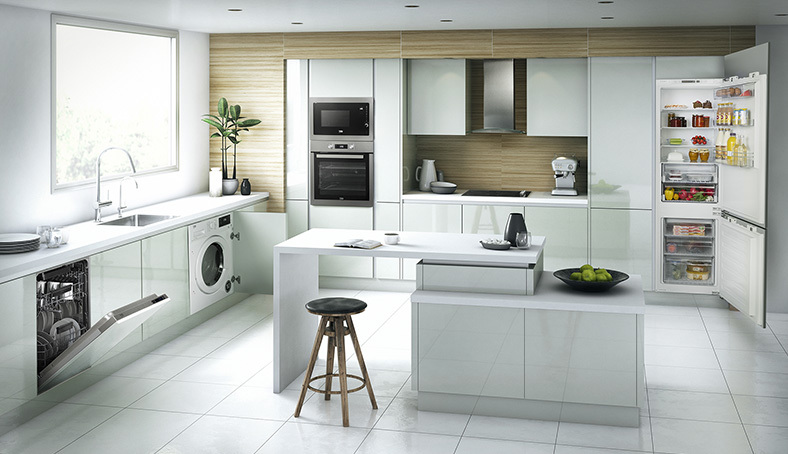 And if you’ve just bought a new house, or are in the process of redecorating, choosing to install a sleek and spacious built-in kitchen is an ideal way to make the most of your home. No longer just a functional room for preparing food and doing laundry, the modern kitchen has become a space to hang out and spend time with loved-ones, whether it’s everyone catching up over an evening meal, or enjoying a spot of baking with the kids. And when you have friends round for dinner, you’ll want your kitchen to be a pleasant, welcoming space where people can come in and chat while you cook. But for those with hectic lifestyles, demanding jobs and big families to look after, the kitchen can also be a chaotic place. Hence, it’s important to maximise the space in the room to ensure people don't get on top of each other whilst rushing around to make breakfast or cook dinner. 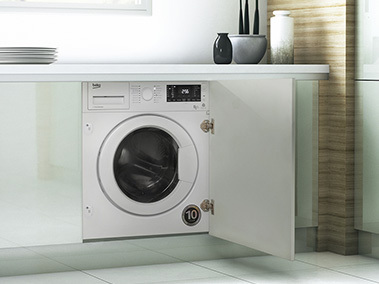 Built-in appliances allow you to make the most efficient use of space in your kitchen. 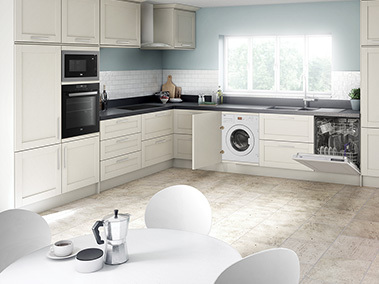 A spacious and stylish kitchen with great functionality is the pretty much the heart of a happy household! An increasing number of houses and apartments are built with a kitchenette and living room combined. An integrated design will ensure your kitchenette doesn’t jar with the rest of your living room, making it a homely spot you’ll want to spend time in. If you want your oven or washing machine to fit seamlessly into your kitchen, built-in appliances are designed for this very purpose. It's a good idea to choose your appliances during the design process, so that your kitchen is built to accommodate them and also so they have the same look and feel, if so desired. A spacious-looking kitchen, with energy efficient appliances that come with a 2-year warranty is a big selling point for landlords wanting to attract tenants into their property, or homeowners looking to sell. E.g. 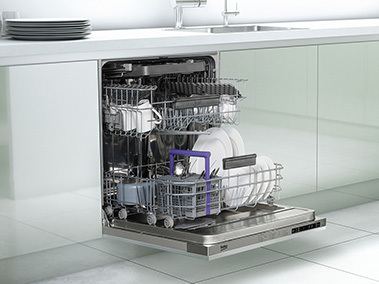 a slim built-in dishwasher is a good idea for smaller kitchens, slotting neatly in-between cabinets without dominating the room. 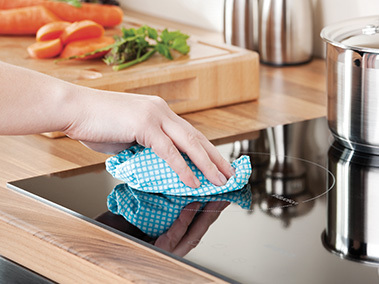 If you have a kitchen with an island unit, cooking enthusiasts might appreciate a built-under oven, so after heating up a dish, you can take it out and put it straight onto the worktop above, making food preparation quicker and easier. 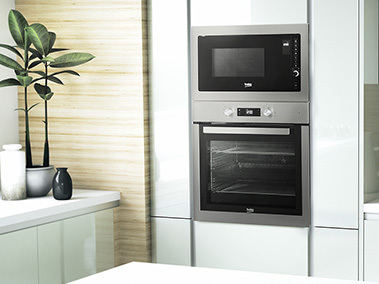 Plus, built-in ovens can be positioned higher in the wall, making it easier to access and check on your food. A built-in kitchen's seamless design minimises nooks and crannies where dirt and dust can build up, making for an easier to clean and more hygienic cooking environment.